So you're at work and need some music to help start the day. You're tired of the same old songs you have in iTunes and your Pandora radio stations have become stale and repetitive. You want something new and fresh, preferably without commercials. With these five music sites, a virtual cornucopia of songs await your ears. Maybe you'll find some new songs you really dig that you never knew existed, or perhaps you’ll just find a mix that takes you on a trip down memory lane. Just be sure to keep your headphones on if you are bumping that Chumbawamba mix. Not everyone wants to go Tubthumping again. The Hype Machine is a great place to start on your new music journey. The site aggregates new tracks from a wide variety of different music blogs and then presents them in a clean and simple way that requires very little site navigation. You can sort songs by what's hot on twitter. All songs play via Hype Machine's own embedded music player, and continuously cycle through to the next song (similar to Pandora). The site has charts for different categories, latest tracks, remixes, and what's popular. 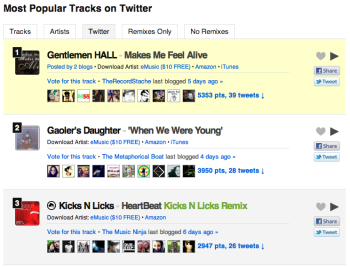 It also lets you see which songs are coming into the site through recent tweets. You are able to “heart” your favorite tracks and share them via Twitter or Facebook as well as access the download links for either iTunes or Amazon. The site is built off of music blog data, so it has an extra bonus of being able to link out to the individual blog article for each song. Hype Machine also has the rather unique option of “spying” on other users from the site. Using this feature, users can see what other people on the site are listening to (updated on a second-by-second basis). Talk about real time music search. Another good quick way to get listening to new music is with 8tracks. The site is similar to an Internet radio station with a twist: All the songs are part of playlists consisting of only 8 songs. You can make your own mix and share it with the world, or simply choose from other peoples’ playlists. 8tracks has a simple design and doesn't get all fancy with tons of complex menus or a busy homepage. It's clean, simple, and to the point. Disclaimer: Using 8tracks could cause severe reminiscing and possibly make your coworkers sick of hearing the words "remember this song?" If you don't want to bother with browsing the whole site for just the right playlist you can search for a particular artist, and 8tracks will bring up playlists that contain tracks by them (as well as similar artists). This can be quite addicting since you'll find songs and artists in the mix you might have totally forgotten about. It harkens back to the cassette tape mixes of the 80's. 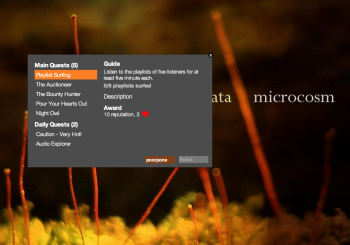 You can choose from among a myriad of categories and featured playlists; each mix has a “cover” that you can mouse over to get a quick description of the mood or style of its contents. The standard Facebook, Twitter, and Google+ sharing features are available, and 8tracks adds Pinterest to the mix as a bonus. 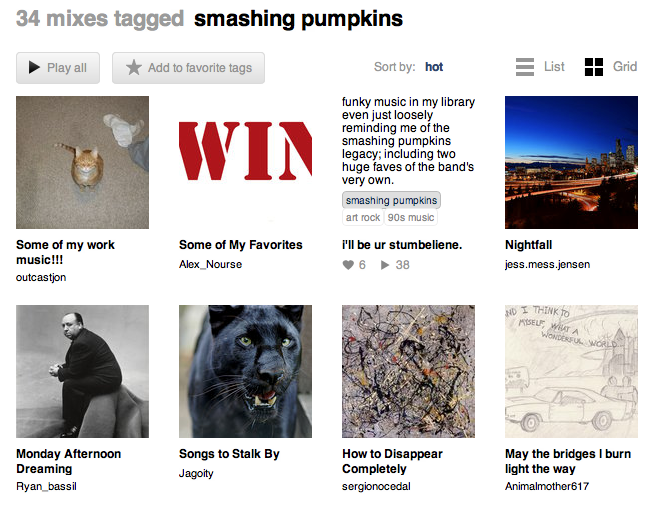 Pinning 8tracks mixes could become a new favorite pastime. A YouTube button next to each song launches a video for that track. Using this feature with a mix of Smashing Pumpkins tracks, I discovered a weird video for Geek USA in which they brought a bunch of clowns on stage. Thesixtyone.com is unlike any other music discovery site in that it has a game component. The site calls itself a music adventure and that suits it just perfectly. Once you create an account and log in you can simply listen to new music from whatever category you like. Or you can engage in one of the many quests it assigns you. Quests are where this site differentiates itself from any other music site. You gain daily quests (such as “Night Owl”, which asks you to listen to music posted to the site between 10pm and 4am because “songs that get posted at the weirdest hours deserve a little extra help”) or you can work on your long-term main quests. New quests are available every day while main quests are ongoing. Upon completing quests you earn hearts (which you later spend to mark songs as favorites) and level up your account. Main quests are a little more involved and sometimes involve other users. You can also save songs you like and create playlists (which may be used in upcoming quests). Each song comes with a full-page takeover of an image from the artist reminiscent of old vinyl album covers. This site, more than any other, can expose you to music that you may never have listened to before. For example, in order to complete a quest I had to listen to 7 songs from the Country category. I don't like country, but after finishing a quest that involved me listening to quite a few country songs I found out I kind of liked some country music. Who would’ve thunk? We Are Hunted is another visually-driven aggregator of music that claims that it "listens to what people are saying about artists via blogs, social media, and message boards to bring you the top 99 songs online at any given moment". While this is a bold claim, it does pull from quite a few different sources to bring you a plethora of options. The site layout is image-heavy and offers up category, remix, and most played charts as well as various playlists. 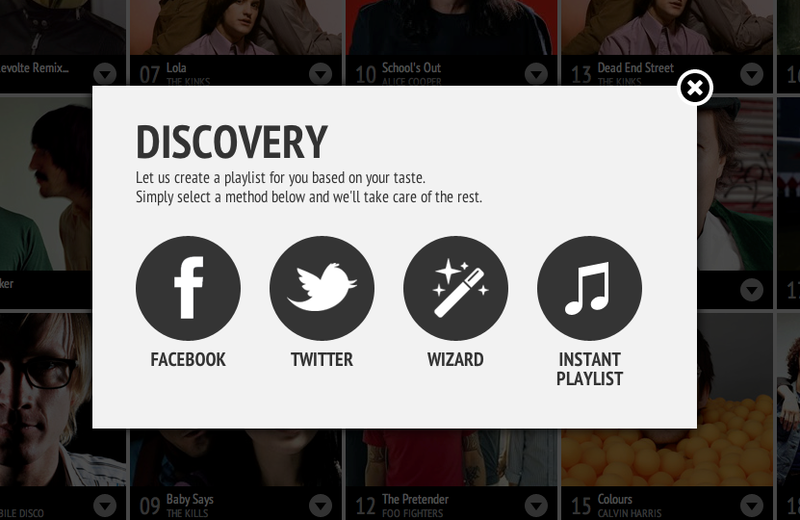 Create playlists based on your Facebook or Twitter activity. A standout feature of the site is its Discovery tab. This feature can create a playlist for you from your twitter or Facebook feed by looking at what music you and your friends have posted about. 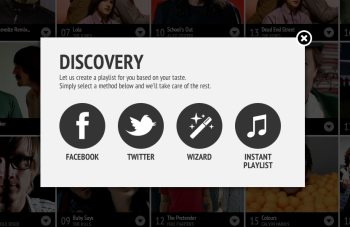 It also offers a wizard that keeps track of your likes or dislikes and can design a playlist from that as well. The new instant playlist feature works off any artist you type into search and builds a song list from that. 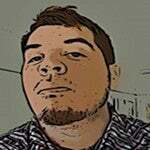 You can then check out the artist bio, read reviews, and share or buy the track right from each song thumbnail. The service is available in a variety of places beyond its Web site, including Spotify, Android, iPhone, iPad, Winamp, and more. Last but not least is SoundCloud. Primarily a site for people to upload their own tracks and share them with the world, SoundCloud is also a great source for new music you may have never heard. It allows any user to listen to all the songs uploaded to the site by anyone, and offers up the option to filter the tracks by Hot, Latest, and Creative Commons. Comment on tracks during the song's playback. You can also follow any user of the site and check out what they're listening to, and once you do, their uploaded or favorite tracks will show up on your dashboard. 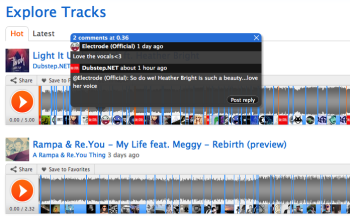 SoundCloud also lets you comment on the songs as they play. Future listeners will see when you commented during playback, and you can reply to the conversation. The Web site is skewed toward electronic and remix tracks, but it also has a wide variety of new and independent music. 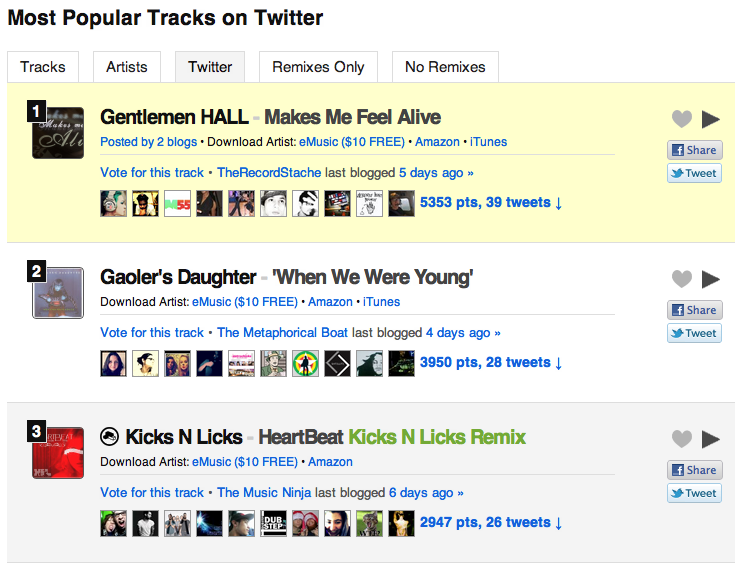 Tracks can be saved as favorites and most of them are available for download (a rarity for most music discovery sites). 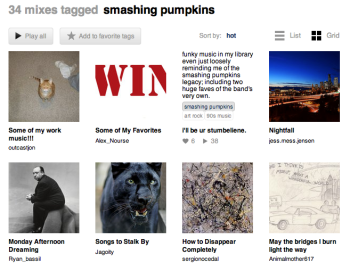 This story, "Five sites to discover new music" was originally published by TechHive.